In UPSC Civil Services Exam, because of the tight competition, even 1 mark counts. Clear IAS Team is happy that our convictions turned right on many occasions and there were lot many direct and indirect questions in actual UPSC exam from Clear IAS Mains High Value Answer Writing Program, Clear IAS Mains Full Length Free Mock Tests and Clear IAS free online study materials. Here is the comparison of clearias.com questions with official UPSC Mains 2014 GS1 Paper. [Clear IAS Qn] – Distinguish between El Nino and La Nina? Explain the influence of ENSO in Indian monsoons. [UPSC 2014 Qn] – Most of the unusual climatic happenings are explained as an outcome of the El-Nino effect. Do you agree? [Clear IAS Qn] – Though repressed with force by the British the Royal Indian Navy mutiny deserves its special place in Indian freedom struggle due to multiple reasons. Trace the reasons. [UPSC 2014 Qn] – In what ways did the naval mutiny prove to be the last nail in the coffin of British colonial aspirations in India? [Clear IAS Qn] – Contrary to common perception, a large percentage of women in India work. Examine statistics on Indian women’s contribution as workers, and find out areas where the women’s participation is essential for their empowerment. [UPSC 2014 Qn] – Discuss the various economic and socio-cultural forces that are driving increasing feminization of agriculture in India. [Clear IAS Qn] – Distinguish between the policy of ring fence and subsidiary alliance. What were the principles of subsidiary alliance? [Clear IAS Qn] – What do you understand by the term ‘Commercialization of Indian Agriculture’ in the backdrop of British policies in India? What were the consequences of this policy? [UPSC 2014 Qn] – Examine critically the various facets of economic policies of the British in India from mid-eighteenth century till independence. [Clear IAS Qn] – List the important water bodies and ice caps in news due to changes in the geographical features. Trace the reasons for change. [UPSC 2014 Qn] – Bring out the relationship between the shrinking Himalayan glaciers and the symptoms of climate change in the Indian sub-continent. [Clear IAS Qn] – Indian National movement was not an isolated movement, but it was inspired by the happening all over the world. How did Russian Revolution influence Indian National Movement? [UPSC 2014 Qn] – What were the major political, economic and social developments in the world which motivated the anti-colonial struggle in India? [Clear IAS Qn] – What are the factors that result in the formation of a tropical cyclone? Why there are more tropical cyclones in Bay of Bengal than in Arabian Sea? [UPSC 2014 Qn] – Tropical cyclones are largely confined to South China Sea, Bay of Bengal and Gulf of Mexico. Why? [UPSC 2014 Qn] – To what extent has the urban planning and culture of the Indus Valley Civilization provided inputs to the present day urbanization? Discuss. [UPSC 2014 Qn] – Account for the change in the spatial pattern of the Iron and Steel industry in the world. One can give some 5000+ questions and 10,000+ page study material and claim that many questions in actual UPSC exam came from them. But Clear IAS took a focused and simple path. Our materials were small in size. We provided only around 75 questions each for GS1, GS2, and GS3. There were 54 essay topic selections and 64 questions for GS4 (Ethics) paper. Our online study materials, provided a guidance for note preparation on the important topics, but these too were never long or heavy. 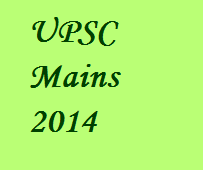 when will you start Mains answer writing for IAS 2015??? Sir,please do some efforts for prelims also…..Provide some mock questons on daily basis for prelims 2015…….This will make this site unbeatable because this is the only segment which your team is missing…..
Mains Test series only later; but Prelims 2015 Test series to be launched soon!